There's loads to like about the 55UB950V. Its pictures sometimes look awesome, especially in 4K, it's well designed, its price is aggressive by 4K standards, and the new webOS interface works superbly. Shame, then, that its pictures fall prey to fairly serious contrast and input lag flaws. After strong 4K/UHD showings this year from Sony, Samsung and Panasonic, the next brand in the 4K firing line is LG, with its 55-inch 55UB950V. The UB950V series sits at the very top of LG's TV range (until the brand rolls out its stunning 4K OLED TVs around October time, anyway). So it's no surprise to find the set bristling with design sophistication and features. Build quality is excellent. Both the black main bezel and silver bottom edge feel robust and the contrasting colours go together nicely. The bezel is eye-catchingly slim too, ensuring that the 55-inch screen takes up no more space in your living room than it absolutely needs to. The rear isn't particularly trim versus some rival models, but then if you're anything like us (and other erstwhile 'normal' people) you spend rather more time looking at a TV's front than its back. If you're wondering why the silver bottom edge on the 55UB950V looks perforated rather than smooth, it's not just a design decision. It's because LG has elected to fit its flagship TV with a set of forward firing speakers that should deliver a more open, detailed and convincing soundstage than the down-firing speakers commonly found on flat TVs. Any flagship TV worth its salt these days will offer a combination of high-end video source support and extensive multimedia compatibility. The 55UB950V delivers in these areas with its four HDMIs (built to the v2.0 spec to offer more 4K playback flexibility), three USBs, and Wi-Fi or LAN support for both DLNA streaming from networked PCs/smart devices and going online with LG's latest on-demand content service. This service is fairly well populated with content, including big hitters Amazon Instant, Netflix, Now TV, BBC iPlayer and Demand 5. Though it remains a shame that LG hasn't managed to pry catch-up TV apps out of ITV or Channel 4 yet. What elevates LG's smart offering from a good service to a great one, is its interface. 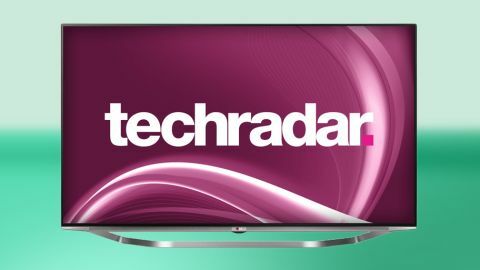 Powered by the webOS platform LG cunningly snapped up 18 months ago, the so-called 'Smart+ TV' system is a joy to behold and use, combining slick, speedily rendered, motion-packed and ultra-colourful graphics with a complete rethink of how to organise smart TV content. It feels so intuitive it's positively empowering. This means it's pretty much the polar opposite of the inscrutable, sluggish, static smart TV experiences we've tended to be faced with previously. There are a few key tricks that help make Smart+ TV so effective. The way everything – even the HDMI inputs – is treated as an app so that it can be properly integrated into the TV's software. This allows for multitasking that lets you have multiple apps open at once and switch almost instantaneously between them (even if you're using one of them to watch 4K). Similarly impressive is the way every source, be it your own content, broadcast programming, an HDMI input or an on-demand source, is given equal importance in the tile-based onscreen menus. For more on the webOS operating system check out the usability section. Dragging myself away from the joys of webOS, there's still plenty to get my teeth into with respect to the 55UB950V's screen specification. It's an edge LED model, as are all LG's LCD TVs this year, and its lighting array is bolstered by a local dimming system whereby segments of the LEDs can have their light output adjusted independently of each other to boost contrast. As usual with LG TVs, the panel at the 55UB950V's heart is an IPS type designed to deliver a wider effective viewing angle than rival panel technologies. Meanwhile the 55UB950V's picture quality is helped along by a quad-core processing engine. This includes multi-level motion processing (LG claims it can emulate a 1250Hz refresh rate via a scanning backlight, frame interpolation and a native 100Hz panel), noise reduction and dynamic contrast features. Serious picture aficionados will be pleased to find an extensive toolset for managing the picture's colours, white balance and gamma setting. There are also multi-level controls for almost every element of LG's picture processing systems. Particularly important among these processing controls, as I'll explain later, are the settings for noise reduction, motion compensation and black level/contrast. So extensive are the picture set up tools that the 55UB950V carries the backing of the independent Imaging Science Foundation (ISF). There are even two ISF picture preset slots available for an ISF engineer to use if you want to pay one to come round and do a pro calibration taking your individual room conditions into account. Last but not least (well, to some people, anyway!) on the 55UB950V's list of features is its passive 3D playback. With two pairs of glasses included free, experience suggests the passive system should deliver fairly crosstalk-free 3D images that don't suffer any of the flickering problems associated with the active system. The passive 3D approach has tended to prove especially effective on UHD TVs, since it allows full HD 3D Blu-rays to be rendered without any of the loss of detail that accompanies 3D playback on passive full HD TVs.